Allows installing longer SN95 front control arms on a 1979-93 Mustang, while also retaining the Fox inner tie-rods. Required when installing MM Fox chassis K-member with SN95 front control arms and Fox inner tie-rods. Suitable for other k-members. Extremely wide range of adjustment, much more than allowed by the tapered-stud style..
Black anodized aluminum adapter sleeves are longer, to effectively lengthen the Fox inner tie-rods to match the longer SN95 front control arms. Aluminum adapter sleeve is threaded with 9/16"-18 SAE threads to match 1979-93 inner tie-rods. Hex on the aluminum sleeve is easily accessible because it is at the inner end of the aluminum sleeve, clear of the tire. 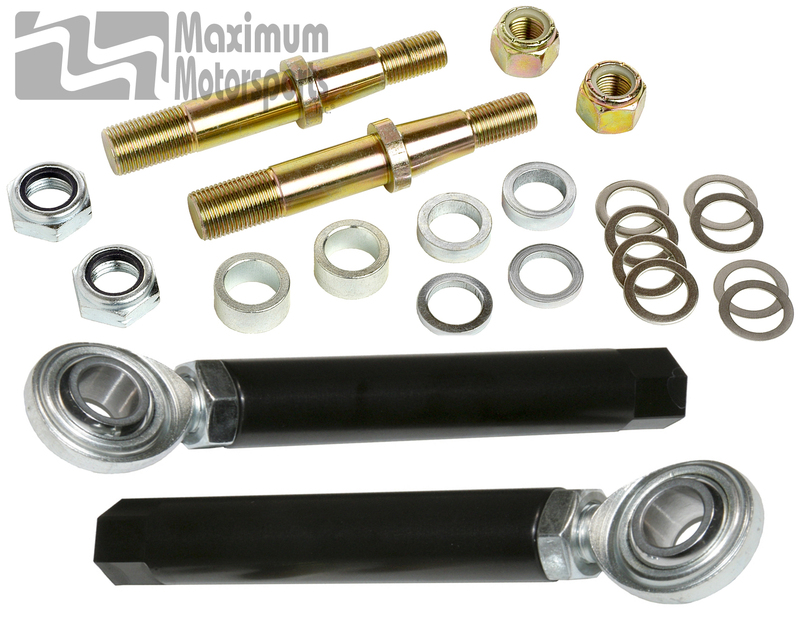 Tapered-stud style (MMTR-7) bumpsteer kit is suitable for stock k-members.